5 Days | Save It! Depending on the number of employees, bathrooms can utilize a lot of water. Toilets use about 40 percent of the water we use in our buildings – up to 3.5 gallons per flush. The Environmental Protection Agency (EPA) states that in the U.S. more than 4.8 billion gallons of water are flushed down toilets each day. Replacing your toilet with a low-flush or dual-flush model can reduce water usage significantly (on average 2 gallons per flush). Low-flow faucets and waterless urinals can further reduce water usage in bathroom facilities. The effectiveness of any system is a function of the total storage volume in comparison to amount of runoff generated by your property. Rainwater collection systems can generate non-potable water for things like irrigation, gray water use for cleaning equipment, cooling mechanical equipment, etc. and can be customized to your needs. Typically, collection systems for commercial properties include cisterns, large underground tanks that can hold thousands of gallons of water. Green roofs are layers of living vegetation installed on top of buildings, from small garages to large industrial structures. They help manage stormwater and contribute to improved water quality by retaining and filtering rainwater through the plant’s soil and root uptake zone. The water that does leave the roof is slowed, kept cooler and is filtered to be cleaner. 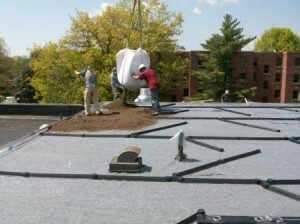 Green roofs can also further insulate the building, reducing cooling and heating costs for your commercial property. Key considerations for implementing green roofs include the structural and load-bearing capacity of the building, plant selection, waterproofing, and drainage or water storage systems. 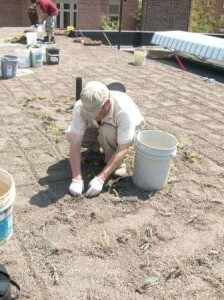 In addition to the stormwater benefits, green roofs extend the life of the gray roof beneath it two to three times. They can help preserve habitat and biodiversity in an otherwise sterile urban environment. Green roofs can also improve air quality by helping to reduce the urban heat island effect. Finally, they can provide garden areas and attractive views . Extensive systems – With 3 – 4 inches of soil and 12 – 40 pounds per square foot of roof area and short plants with shallow root systems, this type of green roof requires only minimal maintenance. 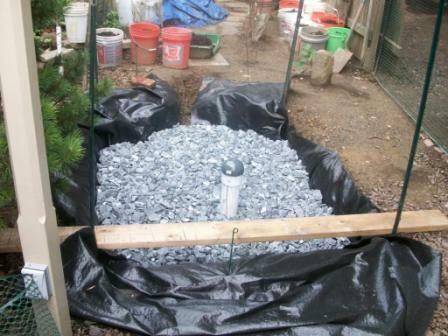 Extensive systems absorb stormwater and improve water quality. Intensive systems – These systems are similar to gardens on the ground. They have a minimum of 6 -12 inches of soil and weigh 80 -150 pounds per square foot, host deeper-rooted plants including shrubs and trees and require more maintenance. For more information on the Lancaster Green Roof program please contact, fschroeder@lancasterconservancy.org, 717-392-7891 x 207. Plan a Community Tree Planting. Ready to do more outreach in the community and get your company’s name associated with a great cause? Lancaster City welcomes corporate participation in helping to fund the planting of trees along streets, parks and in the public right of way. This can be a fantastic team-building exercise while providing positive publicity for your business. Interested? Please contact, fschroeder@lancasterconservancy.org, 717-392-7891 x 207.